Let me just put this out there right away…my sister’s wedding was AWESOME! Not only did I have a wonderful time, I gained another sister. Pretty amazing. But that’s not really what I’m here to talk about. 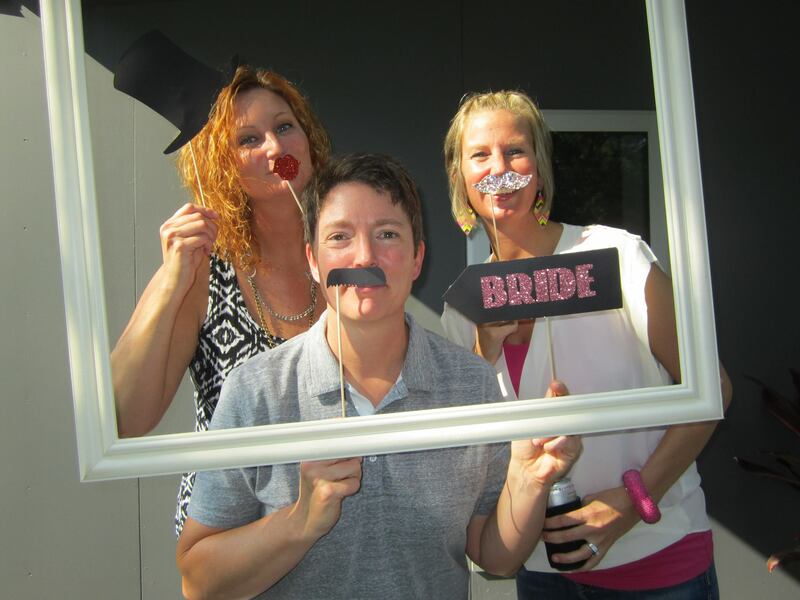 Me, Hilleri, and Heather (Bride). What a fun bach party!! And let me emphasize, FUN! I’m here to talk about my dress. Did you know that this was my 12th wedding? Yes, I’ve been in 12 weddings and it’s one of the most treasured activities that I think friends/relatives can ask of you. I love it. Being part of the center of attention, being able to speak in front of everyone and tell great stories about those getting hitched, and simply just being part of everything….oh, and waving at everyone while you are walking down the aisle. I love that. I’m a little odd, I get it. But anyway, back to my topic. Let me tell you a little bit about my dress (it’s below, and sorry about the blurriness. I made the picture larger so you could see it better). My sister and I got our dresses online and we loved our dress, except mine was a bit short for my liking. Could it be that I’m about 6 inches taller than the typical customer? The dress actually had a built in panel underneath (thankfully) that was hidden and the layering made the dress appear a little longer. Do you know how difficult it can be to purchase an off-the-rack dress to wear for a wedding? Don’t worry, I won’t go completely off the rails about all of the difficulties that I had particularly since I wanted to match my sister (and we have totally different styles). I simply wanted to whine just a bit. It’s a pretty great dress, isn’t it? 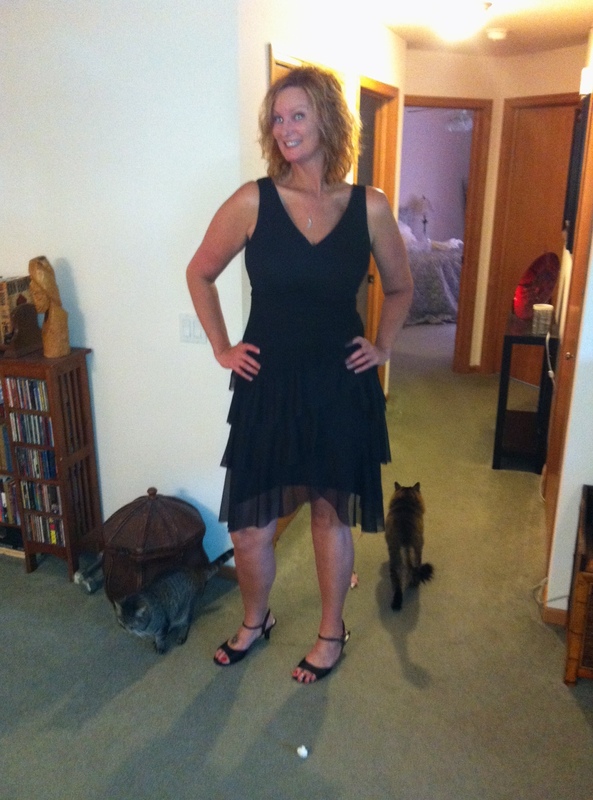 BTW…I feel like I should mention, this is my fitting of the dress. This isn’t the day of the wedding. Now, a bit of a funny story. Because I’m me and although I love to dress up and get the whole ‘face’ on, I was worried about how short this dress was, particularly when I bent over. I didn’t want anyone seeing my ‘lady-bits’…okay I had on underwear so I didn’t want anyone seeing my underwear…SO I wore my mesh gym shorts underneath. Yes I did. It was pretty awesome when I’d had a few drinks and started flashing people! (sorry mom!) Ahem. So to recap, the wedding was amazing and I have a new sister. On that note, it’s been a busy summer/fall and I’ve been traveling quite a bit for personal and for work. I’m always looking for tall stories and although it seems they’ve been a bit sparse recently, I’m hoping they’ll pick up. Fingers crossed.